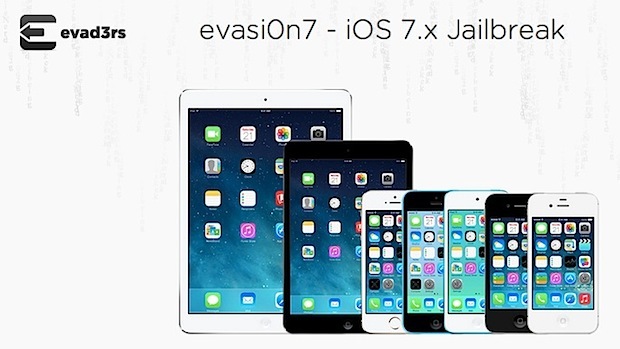 A jailbreak for the iPhone, iPad, and iPod touch running iOS 7 has been released by the “evad3rs” group, titled Evasi0n7. The jailbreak is untethered, meaning it the device can be rebooted freely without computer assistance at any time, and is compatible with all devices running iOS 7.0, 7.0.1, 7.0.2, 7.0.3, 7.0.4, and the two current iOS 7.1 betas. For the less familiar, Jailbreaking uses exploits to skirt around the limitations imposed by Apple on iPhone and iPad software. A successful jailbreak provides root access to the device, which then allows various modifications to be installed atop of iOS, and also provides the ability to install third party software that has not gone through the sanctioning process of Apple and the App Store. Jailbreaks are not without controversy, can lead to a buggier software experience, and they are generally recommended only for more advanced users who have a specific reason to perform the jailbreak. A jailbreak is not the same as a carrier unlock and will not provide the ability to use a iPhone on another cellular carrier. The average iPhone or iPad user has little reason to jailbreak and will probably not benefit from the process. We do not recommend jailbreaking, this is provided for informational purposes. Evasi0n 7 supports jailbreaking iOS 7.0 through 7.0.4 on the following hardware: iPhone 5S, iPhone 5C, iPhone 5, iPhone 4S, iPhone 4, iPad Air, iPad 4, iPad 3, iPad 2, iPad Mini, Retina iPad Mini, and iPod Touch 5th gen.
Back up any iOS device before attempting to use the evasi0n tool. Using the jailbreak utility is fairly easy, but this walkthrough covers the process of jailbreaking any iOS 7 device for users who are curious of how it works or who are less familiar. All jailbreaks can be undone by restoring iOS software assuming a backup was made prior to installation. Again, the average casual user will likely not benefit from using a jailbreak, they may experience crashing and other peculiar behavior after installing it. Accordingly, such a task is only recommended for advanced iOS users. Here are several reasons not to jailbreak. This is worth reading for anyone considering the jailbreak. In summary, the rumor is that a Chinese company paid the evad3r team a million bucks to use the tool to install a bunch of garbage onto Chinese iPhones, and it’s not entirely clear yet what else gets installed with it. It’s not clear if that’s true or if it’s just a rumor, but it’s certainly worth thinking about. The only reason I would consider using a jailbreak nowadays would be to get a new theme to replace and un-uglify the hideous iOS 7 icons. Currently NO THEMES WORK, so all you get is a buggy iPhone/iPad, so this is pretty much pointless. I agree. I love the look of iOS 7. iOS 6 was kludgy looking, and nothing matched. There are a small handful of apps I wish Apple would include. Firewall IP, 3G unrestirctor, Barrel, to name just a few. I’m not sure jail breaking can make the iOS7 experience any buggier. Every time I change the iTunes Radio station while Bluetooth connected to my car, my 5s reboots. I keep getting an error message that Evasi0n is broke and eject the disc. What is with the Mega download site? Thanks! That site worked perfectly! Bitesms is my first app. Thank you so much the mega site downloads the file but dont let you choose where to download it to or tell you where it is. Is this compatible with my android? I would like to run IOS 7 on it. Also what games will this allow me to play? Is this a joke? How would iOS run on an Android phone? No, it won’t work. I have iPad 2 I installed the jailbreak for iOS 7 the only problem is why are my cracked apps blacked out and not responding even though they are on my iPad? The link for the download of the windows version is not workin, check and update it.